A 47Z-Meter boom pump has a vertical reach of 151 ft. to extend to the upper levels of the condominium. Austin, Texas, is known as a destination city for its world-famous music scene, eclectic vibes and college-town vibrancy. In recent years, the area known as East Austin has arguably shown the most improvement as one of the city's fastest-growing, most desired neighborhoods. Restaurants, retail, music venues and other one-of-a-kind businesses are building up the community — and bringing the population with it. 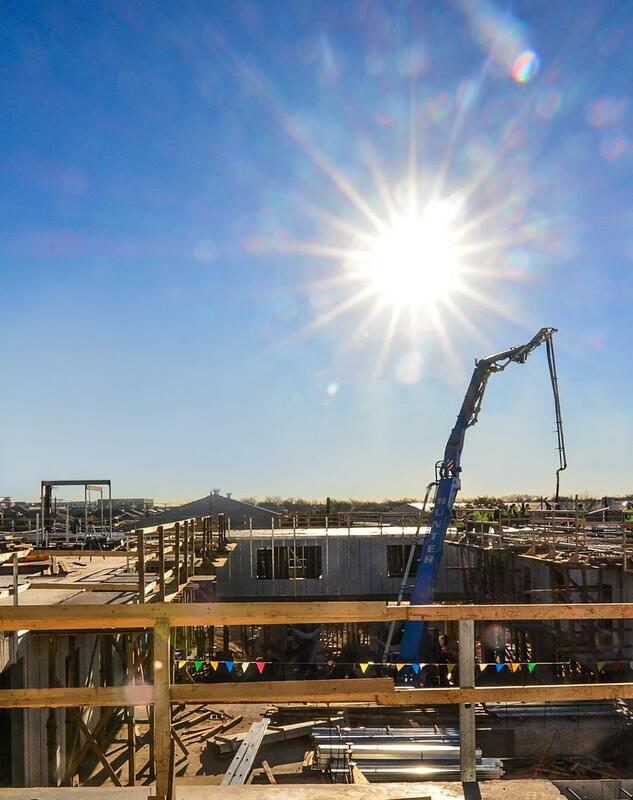 Its “coolness” factor also has attracted many residential contractors including Austin-based developer Capsa Ventures, who worked with local designers to develop FOURTH&: a 4-Star Austin Energy Green Building with 97 condos and 42,000 sq. ft. of first-floor commercial space. 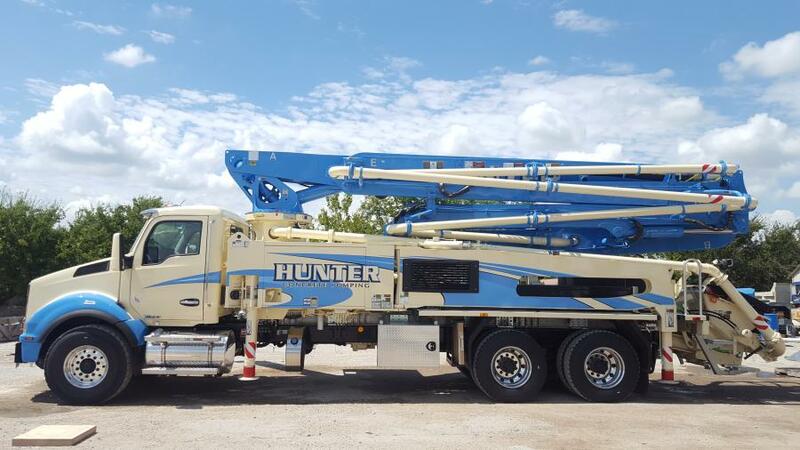 To take on the job, Texas-based Putzmeister customer, Hunter Concrete Pumping brought its 32Z-, 38Z-5-, and 47Z-Meter boom pumps, Telebelt TB 110, and Thom-Katt TK 40 to the job site. One of the largest developments to come to East Austin, FOURTH& sits on 2.2 acres of land and 800,000 lbs. of foundation. It took 200 trucks to pour the 130,000-sq. ft. mat for the condominium. 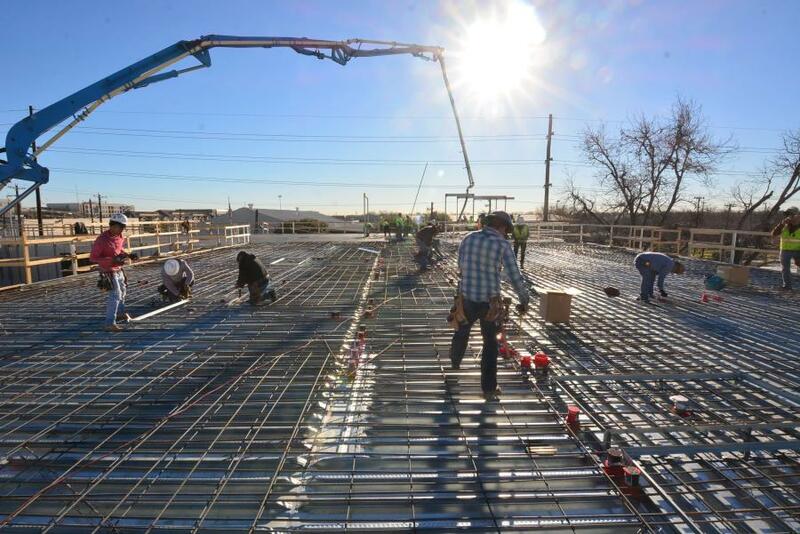 The pour schedule for this development demanded a fleet of pumps that were able to pump at high volumes for eight hours or more to keep the project on track. 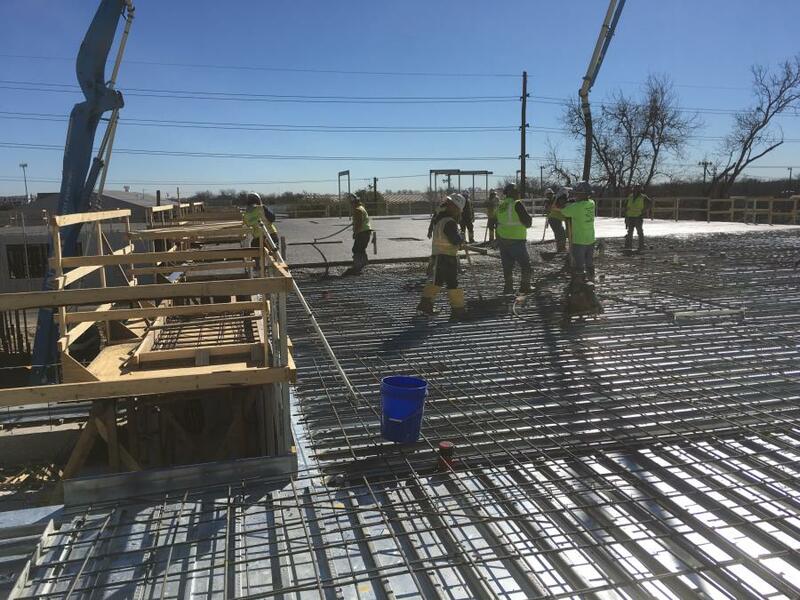 Hunter's pumps were able to stand up to the pour schedule without any mishaps. When construction began in August 2016 on FOURTH&, Capsa Ventures wanted to make sure this condominium was built to last while being conscious of the environment. The building's framing structure was constructed entirely out of steel, concrete and an interior panel system that would allow the construction to be accelerated. The interior wall panels are recyclable and made of light gauge structural steel and expanded polystyrene foam. The first floor of FOURTH& was designated for commercial retail space. In an effort to market the ground level to a variety of industries, developers left most of the space unpoured and open to customization. The TK 40 trailer pump was used to pour small sections of the first floor for spaces that were already purchased by retailers. The trailer pump also was used to pump around electrical and plumbing openings to seal off any potential for leaks. This way the space can still be customized to the specific needs of the retailer without needing to break into the foundation. The condominium project also brought a new condo layout to Austin called a micro-unit. Similar to a typical efficiency layout, micro-units span just a few hundred square feet. 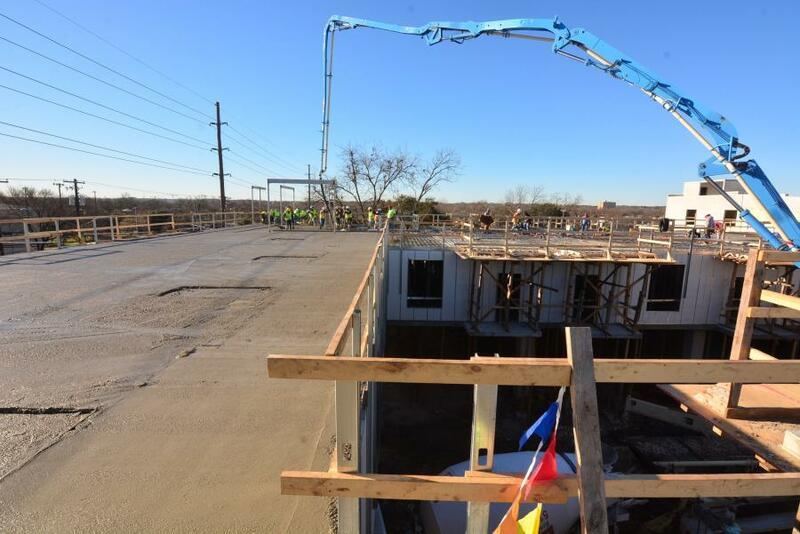 The design of these units called for concrete pumping equipment that could fit in tight spaces. The outriggers needed to be able to fit in what would eventually become courtyards for the complex and were less than 35 ft. wide. Putzmeister's one-sided support (OSS) system minimizes the footprint by requiring only the two outriggers on the working side of the truck to be extended while the boom is in operation. Through a series of sensors, the OSS system is able to define a safe working area that prevents the operator from positioning the boom outside the safe operational range. The contractor used the OSS system on the 32-meter boom pump to reduce the footprint of the outriggers from 22 to 16 ft. OSS was critical on the job site and allowed the contractor to reach into the tight and confined areas of the project. The size of these micro-units created overhead restrictions for much of the pour. “The majority of the overhangs were not much higher than the unfolding height of the 47Z,” said Hunter Concrete Manager Beau Benoit. The 47-meter boom pump was the perfect solution for the job site conditions because the typical unfolding height of a 47 is roughly 31 ft. The range of the larger boom pump allowed the contractor to reach more pouring locations from one set up location. A 38Z-5-Meter boom pump also was used in the cramped spaces. The 38-5 has a five-section boom arm for increased maneuverability. Unlike four section booms, a five-section increases the number of points able to be manipulated by the operator. The five-section boom pump was the primary machine used when the operators needed to navigate under overhead obstacles such as beams and floor pans. Next to the condominium stands a multi-level parking structure for residents. Small trailer pumps are ideal for pouring inside a parking structure of this size. “The Thom-Katt came in handy when pouring different levels of the parking garage,” said Benoit. The underground level of the parking structure has a ceiling height of 8 ft., which is not enough room for a boom pump to unfold. A trailer pump was parked outside the parking structure with ready mix trucks near, while a laydown hose snaked its way into the underground levels to pour the pavement inside the structure. The high demand for residential living on the East side of Austin inspired Capsa Ventures to set sights on the location for a timeless, flexible building capturing the essence of Austin. Owned by Canvas Properties, FOURTH& has become one of the area's largest developments and has earned four stars for its energy efficiency and sustainability. The building has many amenities including a movie theatre lounge, pool, electric vehicle charging station and a dog washing station. Today, tenants are moving into their new micro homes and enjoying all of the amenities in the FOURTH& neighborhood. The three-story condominium is located less than one mile from downtown Austin. FOURTH& units were made available for purchase in March of 2018. Hunter is a proud Putzmeister customer and wouldn't have been able to maneuver the job site with such ease without the company's machinery. “We definitely recommend Putzmeister to anyone who asks. We're extremely happy with the equipment and we look forward to our next project,” said Benoit.